At this point in our lives with our busy jobs, small apartment, and the amount that we travel we’re not at a place to get a dog. We watch instagram videos all the time of cute puppies playing and I will literally be on the verge of tears from all the cuteness, but still, we want to be settled and have a house before we have any sort of pet. That’s why this past weekend was THE BEST, because we got to dog/house sit for our two friends who are on their honeymoon! They have the cutest golden retriever, Cooper, who is the chillest pup of all time. I swear he sleeps 18 hours a day at least and loves to be cuddled non-stop. It’s been so nice to get a glimpse of dog life, as well as use a big kitchen for once! With the Fall weather already here, we spent the weekend making cozy dishes like my favorite lamb & butternut squash curry, apple pie, and this whole baked cauliflower with béchamel! At first I was skeptical just eating cauliflower for dinner. Your girl here has an appetite and I wasn’t sure this would be satisfying. I was so wrong. This is seriously one of the best veggie dishes we’ve ever made. 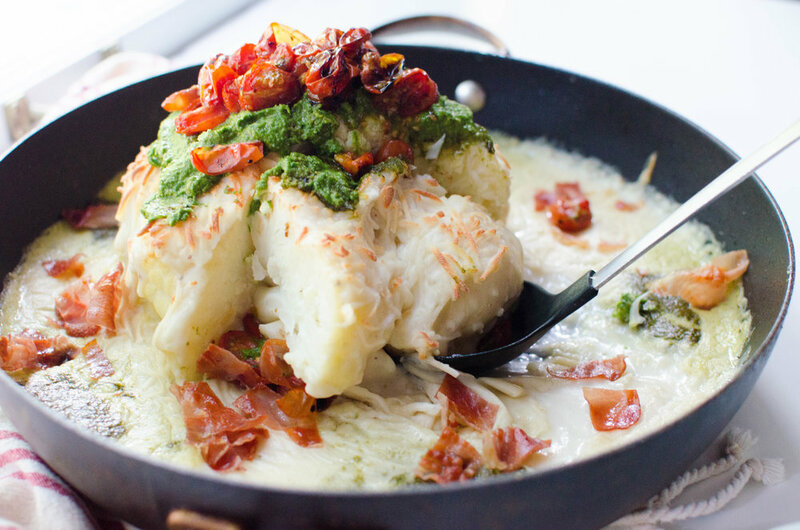 Super tender cauliflower covered in a garlicky cheesy béchamel sauce and topped with crispy prosciutto, pesto and roasted tomatoes. 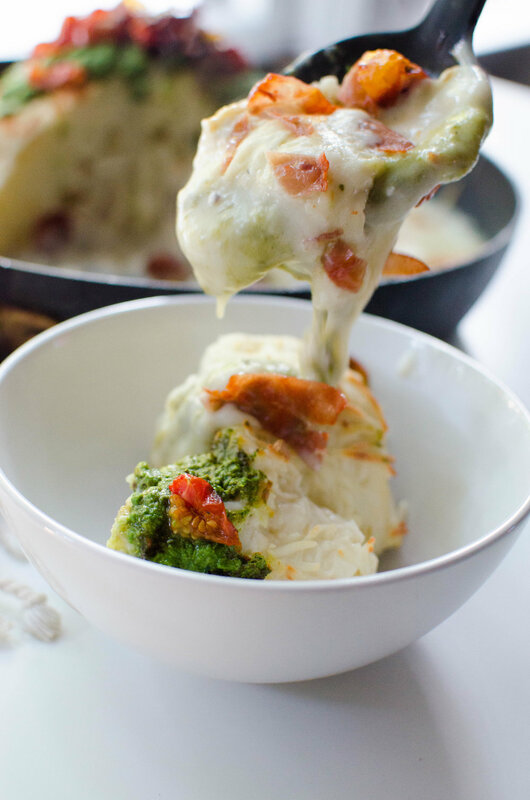 Such a cozy meal for Fall and Winter! To make the cauliflower, use a paring knife to cut the core out of the cauliflower: Flip the cauliflower over so the stalk is facing up. Insert the paring knife about 2 inches into the cauliflower, as close to the stalk as possible, and cut around the stalk. The goal is to leave the cauliflower intact while removing the stalk and creating a small hole where it once was. Heat a large pot of water to a boil, and boil the cauliflower for 10 minutes or so until it’s starting to get tender. Preheat oven to 400 degrees. Transfer the cauliflower in a large oven-proof skillet and drizzle all over with olive oil and season with salt and pepper. Roast the cauliflower for a remaining 30 minutes or until the top starts to brown and a knife can easily slice into the cauliflower flesh. About halfway, sprinkle the cauliflower with grated parmesan and let it get golden brown. Halve the cherry tomatoes, drizzle with olive oil, and season with salt and pepper. Place in a baking dish and roast in the oven with the cauliflower. While the cauliflower and tomatoes are roasting, make the béchamel sauce. Heat the milk in a heavy saucepan over medium heat until steaming but not boiling. Turn the heat down and keep warm over very low heat. Melt the butter in a separate saucepan over low heat. When it's bubbling, add the flour and whisk until it forms a golden paste, about 3 to 4 minutes. Whisking constantly, add the hot milk in a steady stream. Bring the milk to a gentle simmer and continue to whisk until the sauce thickens, about 10 minutes. Whisk in the nutmeg and the cheese. Fry the prosciutto slices in a skillet, transfer to a paper towel to dry, and chop into bite size pieces. 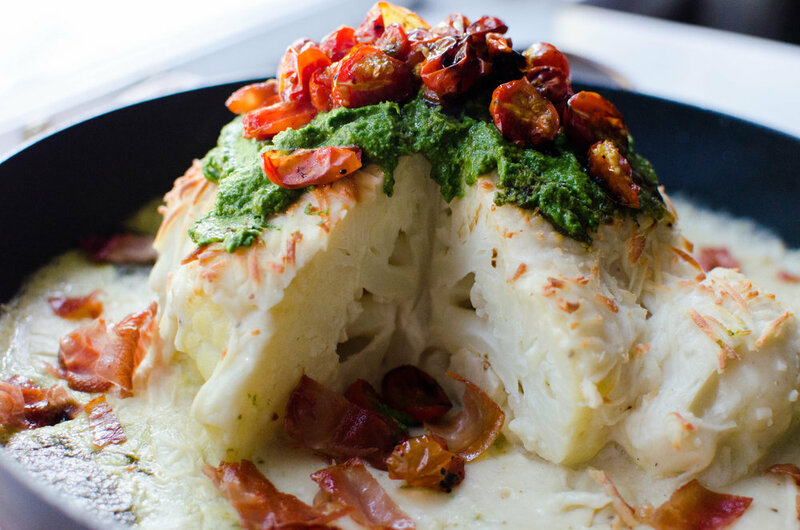 Top cauliflower with pesto, roasted tomatoes, béchamel, and prosciutto! Enjoy!